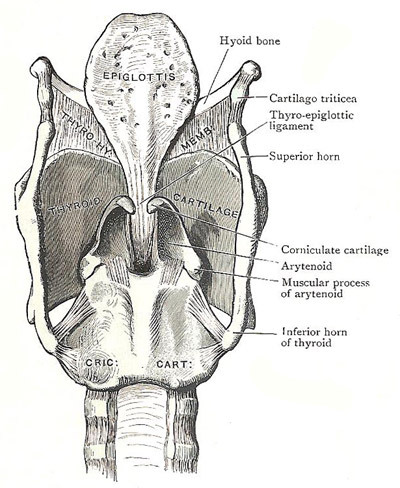 Posterior aspect of cartilages and ligaments of the larynx. The arytenoid cartilages, which consist mainly of hyaline cartilage, are a pair of three-sided pyramids that rest on the upper border of the lamina of the cricoid cartilage. The apex of each is directed upward, and curves backward and medially, and supports the corniculate cartilage. The base articulates with the upper border of the cricoid lamina. The posterolateral angle of the base is thick and projecting, and is called the muscular process because the cricoarytenoid muscles are inserted into it. The anterior angle of the base is prolonged forwards as a pointed spine called the vocal process because the vocal ligament is attached to its tip. The surfaces of the cartilage are medial, posterior, and anterolateral. The medial surface is narrow, vertical and even, and is clothed with mucous membrane. The posterior surface is concave, and gives attachment to the arytenoideus transversus. The anterolateral surface is the most extensive of the three, and is uneven for the attachment of the thyroarytenoid and vocalis muscles and the vestibular ligament.